Of all seven possible routes Mount Kilimanjaro has the Machame Route is by far the most popular, and it is the route that Jordan and Ian have chosen to climb. 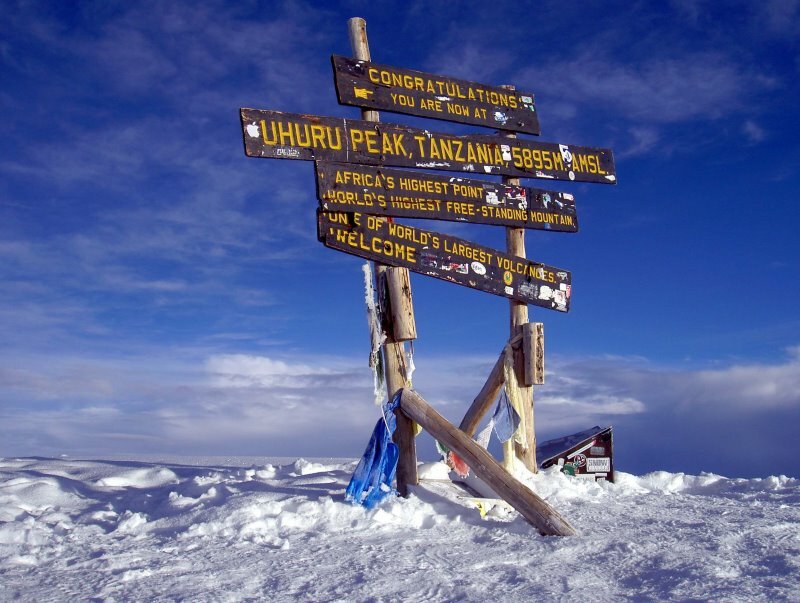 Spread over 6 days, the 37 mile long Mount Kilimanjaro trek is defiantly not for the faint hearted! Being the hardest, and most adventurous climb the highest mountain in Africa has to offer, lets just hope the lads are ready for the challange! With the most impressive views and a huge vary of habitats to see along the way, more than 50% of climbers chose this route each year. ‘Dutch Courage’ may be needed for this challange as The Machame Route is known as the ‘Whiskey route’ due to being one of the toughest climbs. In contrast to the Marangu route which is known as the ‘Coca-Cola’ route, for being one of the simplest and over-crowded climbs. The Machame route has been reportedly said to have the best combination between price, difficulty and scenic views. Along the Machame route there are un-countable fantastic veiws, including the cloud forest of Kili’s southern slopes. The Machame route can be completed in a minimum of six days however is usually done in 7 days (6 nights) so acclimatization is easier. Although the day walks are longer and steeper than all the other routes, this is rewarded by the stunning views and experiences you will receive. Beginning at the southern end of the mountain floor, with its luxurious rain forest at the Machame gate. With only a hiking distance of 3.5 miles the first day is roughly moderate, so with a relaxing hike you can take in the spectacular views. Walking 3.5 miles again, with a trekking time of between 4 and 6 hours you will be climbing 2690 ft. Your second day will see you walking out of the rainforest to climb a steep ridge into moor land. You will start to notice the vegetation and wildlife becoming sparse now. You will be ending your day by Shira Plateau where you can see the lovely Kibo Peak, resting your head down at 3850 meters! Day three is the third furthest trekking distance during the whole 6 days! Walking 6.2 miles from the New Shira Camp to the Barranco Huts. The scenery on day three is spectacular as you traverse river valleys. There are great views of the Kibo Massif, one of the Mountains volcanic cones, and its magnificent surrounds! The Barranco Huts has been said to be the prettiest camp-site you will visit on the trek. Your fourth day is expected to be tough, as you are climbing up and down the craggy landscape. The day will start of as you walk through the dry derelict desert to end in the deep snow and ice! Barafu meaning ‘ice’ in Kiswahili, gives you a hint that you will be staying at a very icing point on the mountain! Your trek will start around midnight as you hike up scree and occasionally snow to Stella Point, which is 5,780m high! Hopefully you will arrive at Stella Point in enough time to see the sunrise, but we’re sure it’s beautiful from wherever you are stood. Leaving Stella point it is a 1 hour trek along the rim of the crate at Uhuru Peak, reaching a staggering 5,896 m, the highest point in Africa. You will be touching the clouds at this point as you’ve reached the top! After plenty of photos and selfies at the top, you continue onto Millenium Camp for a well-deserved chill out!!! The final decent down Mount Kilimanjaro begins. After an extremely difficult few days, you start to begin your climb down the mountain, the challenge is almost insight you can now start to feel the victory and smell the beautiful hot chocolate waiting for you at the bottom! The countdown is nearly coming to an end. Jordan and Ian take on Mount Kilimanjaro in a couple of weeks. Your Money Claim wishes the two of them lots of luck! The lads are fundraising for two amazing charities and we are so proud to have followed their story. They are raising funds for are The Marie Curie Cancer Trust & The National Autistic Society. Every penny counts and every donation is extremely appreciated by Jordan, Ian and the two charities. Finally, if you or somebody you know are involved in a good cause or raising money for charities we would be delighted to hear about them and to help promote your good causes.